Christian Davis - Pincher Creek's Mustangs Football organization held their year-end awards banquet on Saturday evening November 5 at Matthew Halton High School. After an amazing potluck dinner Mustangs President Faith Zachar opened the 2016 awards ceremony, celebrating the players' achievements during the organization's 21st season. Zachar began by giving roses to and acknowledging the efforts of to key organizers and administrators Kim Lissel, Melissa Saulnier, Janelle Jorgensen, Erin VanEe. Colleen Hann, Kelly Nelson, and Michelle Duncan. 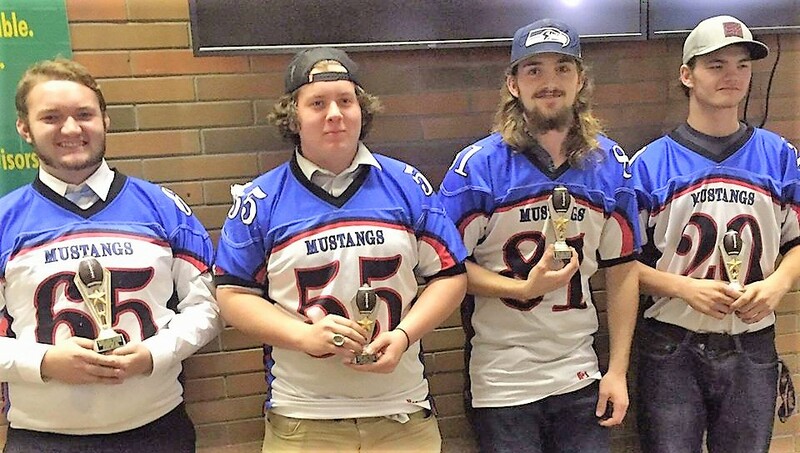 Zachar later explained that the Bantam Mustangs didn't have enough players this season to compete effectively in the Southern Alberta High School Football League (SAHSFL). She thanked Bantam Coach Travis Liscombe for managing to arrange five games anyway, the same number of games they would have played had they been in the league. She also thanked PeeWee Coach Jeremy Nelson for the PeeWee's successful season. Peewee Coach Jeremy Nelson extolled the "amazing feeling" he's experienced as a coach and also praised the executive and support staff for their efforts. Bantam Coach Travis Liscombe talked about the "year of surprises" the team had this season, from his appointment as head coach, to finding opportunities to play games, and to paying those games with a minimal bench. "Something special happens when you have to play a game with 12 players"
Senior Mustangs Coach Wayne Alexander acknowledged the efforts of his coaching staff and assistants throughout the season, with special mention of trainer Bryan Lissel, who has been with the Mustangs for six years. "It was a strange year of football for us, for all of us," said Alexander. The team had only one win this season, their opening game against McCoy's Colts. In addition there were a number of serious injuries. "If winning is a criteria for success, it was a disappointing year. We had so much potential and underachieved in the win column... but there wasn't a game that any of didn't think that we could win. I believe in my six years here that this team had as much talent, maybe more, than any other teams I have coached." 14 Retiring (graduating) Mustangs this year were given a souvenir blue horseshoe: Dylon Anderson, Shae Robertson, Colton Teneyche, Logan Kaack, Tyler Riviere, Craig Oliver, Bruce Kirby, Tyson Malhi, Levi Root, Brenden Lissel, John Walker, Austin Bruder, Matthew Duncan, Brandon Giesbrecht. Adam Schoening was a member of the very first Mustangs team in 1995, and his son Justin was a member of the 2016 Bantam team. "There's one person that's been here 21 years," said Adam, before giving Mustangs President Faith Zachar a big hug.